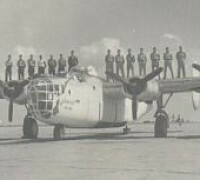 In June 1943, a detachment of five aircraft was sent to Belem, a base destined to be the most active for VP-94 as far as anti-submarine operation was concerned. About this time renewed activity of enemy submarines and the inability of the newer Ventura squadrons to operate from bases at great distances from the convoy lanes required the further splitting of 94 into detachments. When the convoy system was extended southward from Bahia to Rio de Janeiro, four planes were ordered to Santos Dumont airport for operations. 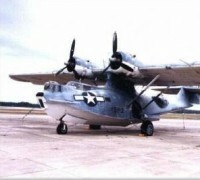 Catalinas were kept busy flying coverage and anti-submarine sweeps around the clock. Another detachment was sent to Amapa, a small settlement in northern Brazil. The air strip there was very short and every landing and take-off, especially at night was an event to be remembered. The first direct contact with the enemy by VP-94 occured shortly after dawn on 14 May 1943. Lt. (jg) John C. Batchelder, Jr.,USNR, 95616, had departed from Parnamirim Field, Natal to provide coverage for TB-13. The plane had just passed through a rain squall when the bow gunner sighted a submarine dead ahead, three quarters a mile distant, at a position 04-25 South, 35-10 West. The plane was so close that the nose interfered with the pilot's view for a moment. He nosed the plane into a steep dive with power off, and as the submarine submerged, started his stop watch. Just before the submarine submerged the tail broke out of the water at a sharp angle. The plane was still at an altitude of 500 feet when over the spot of submergence. No drop of depth bombs was made; as such a drop would have to have been made from a sharp turn or skid at a comparatively high altitude. However the bow gunner opened up immediately after sighting the U-boat. His bullets were seen to strike in and around the conning tower. The squadron commander held meritorious mast 15 May 1943 and commended the bow gunner, Lombardo, Joseph (n), AMM3c, 316 78 75, for his display of "notable alertness and presence of mind in the performance of his duty while engaged in action against the enemy." July 1943 proved to be the red letter month for VP-94. The night of July 7-8, convoy TJ-1 was attacked in the Trinidad area, two ships being sunk and others damaged. Planes were immediately dispatched from Belem to operate out of Amapa, taking over coverage of the convoys. 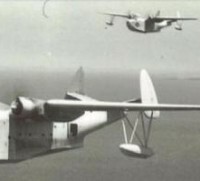 On the morning of 9 July several sightings were made at a distance, both by planes and surface craft, indicating that the attack was being continued. BT-18 was entering the area from the South at this time and it was necessary for five planes in Belem and a limited number of pilots to give night and day coverage and fly daylight sweeps. Lt. (jg) Stanley Ernest Auslander, USNR, 104 673, Lt(jg) John Milton Elliot, USNR, 113 067, Lt.(jg) Frank Joseph McMackin Jr., USNR, 112 627, in 94-P-1, enroute to relieve on convoy coverage, sighted the swirl of a submerging submarine just before noon and advised the base that gambit tactics would be employed. At approximately 1230 Peter, 94-P-10 sweeping the area immediately east of TJ-1 sighted a surfaced submarine about 60 miles distant from the swirl sighting. Just after starting the first leg of the sweep at 1235 Peter, the co-pilot sighted the U-boat 12 miles distant at 03-54 North, 49-52 West. The submarine apparently did not see the plane until quite late for no attempt to submerge was made. At a distance of more than a mile from the submarine, orange flecks from the submarine's anti-aircraft fire were noticed, and almost immediately thereafter an explosive shrapnel shell entered the bow on the port side exploding against the instrument panel, setting fire to the Sperry oil, and causing billowing smoke and flame. The pilot, Lt. (jg) Frank Fisher Hare, USNR, 112 640 was struck by shrapnel in the head, heart, and body. The run was continued and the two starboard depth bombs released. Interrogation of those of the crew who could see the drop of bombs indicated that they landed close together, approximately 25 to 35 feet from the stern of the submarine and about 45 degrees to starboard. There was no visible indication of damage. The bow gunner fired his .30 calibre guns continuously during the approach and the port blister ;.50 calibre gun was brought to bear after the drop. About 20 to 30 minutes after the original attack, the plane departed, the submarine being still surfaced. The evaluation of the attack was "no damage." 94-P-1 and 107-B-5 investigated the area about 1300 Peter, but found no traces of the submarine. Lt(jg) Hare was posthumously awarded the Distinguished Flying Cross and the Purple Heart. Meanwhile, 94-P-1 continued its gambit and at 1424 Peter, a surfacing submarine was sighted about three miles dead ahead, position 03-22 North, 48-38 West. The plane was flying at 3700 feet over a broken cloud base of .4 to .6 cumulus at 1700 feet and had just passed through a fairly heavy cloud. The U-Boat was about 2 1/2 miles distant. As the pilots could not see the submarine, the nose was pushed over to bring it into view. Water was running from its decks and within a few seconds it was fully surfaced, cruising at about 15 knots on 125 degrees true. The pilot held the plane in a dive directly toward the submarine, without changing course and threw on the bombing switch. Lt. (jg) McMackin blew the warning horn and rushed to the waist compartment to take pictures of the enemy underseas craft through the port blister. The throttles were cut, but still the plane attained a speed of 200 knots indicated. At an altitude of about 150 feet, Lt.(jg) Elliot released the depth bombs by intervalometer spaced at 73 feet. The submarine was fully surfaced, proceeding on course, and there was no evidence that the crew, three or four of whom could be seen in the conning tower, were aware of the approach of the plane. An easy turn to port was made after the plane was pulled out of its dive and while the spray was still visible. When the water subsided no trace of the submarine would be seen. All of the occupants of the waist hatch were thrown into the bilges by the pull-up. The gunner had been firing the .50 calibre and had sprayed the conning tower with 7 to 10 rounds. As he fell, the gun was apparently elevated, so that one or two bullets went through the starboard wing of the plane. No serious damage was done. While circling, a greenish-brown slick was visible and in the center of it, two swimming men, a large timber, several small articles and two boxes. A crew member then reported seeing three additional men in the water and Lt.(jg) Elliot spotted them on the next approach. Five were counted at this time, but three apparently sank very quickly. A life raft was dropped, but drifted away before the swimmers could reach it Four life jackets were dropped, two inflated and two deflated and the survivors appeared to get into the inflated ones. Emergency rations were also dropped within reach. Four minutes after the drop a large amount of oil started to rise two or three hundred yards from the slick along the sub's track and observation showed the slick continuing to grow in length and breadth to a size of half to a mile long and a quarter of a mile wide. As a result of the action, Distinguished Flying crosses were awarded to Lt.(jg) Auslander and Lt.(jg) Elliott, Air medals to Lt.(jg) McMackin, Denauw, Watson, Garren, Smith, and Mustone.